Andrés Manuel López Obrador's victory in Sunday's election signals new hope for Mexico. But implementing his radical programme may resuly in a severe backlash both at home and abroad. David Adler reports on AMLO's chances, and the hope for a new Mexico. Andres Manuel López Obrador is the new president of Mexico. I am thrilled to write these words, and feared I never would. Over the last half-century, the story of the Mexican left has moved from repression to corruption to violent self-destruction. With Sunday’s election – and the Morena Party’s full sweep to power, taking both houses of Congress, the Mayoralty of the Mexican capital, as well as the Presidency – a new chapter begins. Mexico is full of hope. International coverage of Morena’s election has worked hard to dismiss AMLO’s progressive platform. They attribute AMLO’s success to Trump, claiming that he both benefitted from anti-Trump sentiment and copied directly from his playbook. 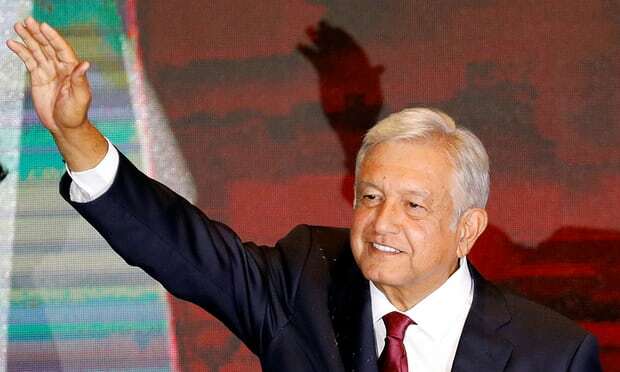 They attribute success to his ‘Messianic’ personality, claiming that his cult of #AMLOvers fell for his “political showmanship.” Or they attribute his success to simple anti-incumbency, claiming that AMLO won because President Enrique Peña Nieto lost. But AMLO’s victory was, in large part, the product of his policy vision; the “National Plan 2018-2024.” Moving away from Mexico’s clientelistic mode of electoral competition—trading gifts for votes, twisting arms for community support—Morena offered a program that addressed Mexico’s three major crises: crime, poverty, and corruption. These proposals, and their potential to transform Mexico, were the real triumph of Sunday’s victory. But they are also AMLO’s biggest weakness. Mexico’s institutions are rotten to their core, and the law is almost always contaminated as it moves through them. The country has already enshrined scores of progressive policies on issues like human rights and citizen participation. But without state capacity, they have remained dead letter. AMLO’s challenge then, is not simply to implement his progressive policies but to reconstruct the Mexican state from the ground up. The Mexican situation is broadly defined by three overlapping crises—one social, one economic, and one political. Morena’s policy vision provides concrete solutions to each. The social crisis is one of extreme insecurity. Last year, the Mexican government reported a record 29,168 homicides, while another 30,000 citizens remain missing (fractions of the total, given that 92 percent of crimes in Mexico go unreported). The government’s complicity in this violence runs deep: disappearances, extrajudicial killings, and torture by Mexico’s security forces are widespread and well documented. ‘Fue el estado’ has become a common explanation for street violence and narco corruption in Mexico. It was the state. Make no mistake: Mexico is at war — and not simply between cartels, but against the communities in which they operate. International coverage has largely failed to give life to the large numbers: the 7,000 missing children, or the 100,000 civilians lost in the last decade alone. These are not soldiers. They are citizens. Many observers have called for a crackdown on the violence. But the military crackdown under President Felipe Calderon was what got Mexico into this mess. It will not be what gets Mexico out of it. A radical change of approach is necessary. Enter AMLO. López Obrador has called for a “Peace and Reconciliation Plan for Mexico,” which will offer amnesty for those social groups that are vulnerable to recruitment by the drug cartels — but exclude violent criminals. He has proposed a new Sub-Secretary of Transitional Justice, Human Rights and Attention to Victims, which will lead a Truth Commission to investigate, report, and litigate the killings of the past two decades. It is a radical proposal, for sure, but it also has a long history in Latin America. Mexicans are ready to give it a chance. The economic crisis is one of poverty. Despite promises from President Peña Nieto that resource privatization would boost the Mexican economy, growth has slowed, oil production has plummeted, and poverty levels remain at a staggering 47 per cent with 1 in 10 Mexicans living in extreme conditions of poverty. Minimum wage remains at a mere 80 pesos per day, or $3.55, covering only a third of basic necessary goods. All this, of course, in a country with 14 billionaires worth a total of $116.7 billion. The political crisis is one of corruption. The Mexican state is shot through with rent-seeking — from the highest office, where President Peña Nieto’s wife cut a backdoor deal to build a mansion, to the street-level policeman who turns a blind-eye to local drug-running. It’s hard to overstate how ineffective the Mexican state has been in cracking down on corruption: in 2016, the authorities seized $32 million of a total $58.8 billion in illicit revenues that passed through the country. Since Peña Nieto arrived to office, Mexico has fallen 30 places on the Transparency International corruption index. It now sits beside Russia. Recent coverage of López Obrador has suggested that these are cheap populist tricks. In his middle-class home and his modest car, he presents himself as a man of the people: it reeks, they say, of opportunism, of showmanship. But optics matter. In a wealth-obsessed country like Mexico — where the nouveau riche go to great lengths to consume conspicuously — AMLO’s commitment to modesty represents an important commitment to Mexico’s poor. And Mexico’s poor, sensing as much, have invested their faith in his presidency. However, the political mess that AMLO was elected to clean may well be his undoing. In part, Mexico’s rampant corruption is a product of its fairly decentralized state. In the 1990s, at the peak of social movement mobilization, the Mexican government decided to devolve significant powers to municipal and state governments. The move was seen as major step toward democratization. But the end result was state capture by the cartels and a toothless central government. AMLO is tasked with building the capacity not only to root out corrupt officials across the country, but also to replace them with a new crop that can implement his ambitious agenda. This puts López Obrador, and his Morena administration, in a bind. If he succeeds in his effort to reconstruct the Mexican state and introduce wide-ranging reforms, he will be slandered as authoritarian, centralizing power to realize his platform; Chavez in Mexico. If he fails to follow through on his ambitious platform, however, he will be slandered a false prophet. International observers are already lining up to blame López Obrador for the failures of his first term: “Mexico’s president-elect has far too many promises to keep,” writes the Washington Post’s editorial board. Unfortunately, given the scale of Mexico’s state failure, they may be right. AMLO is damned if he does and damned if he doesn't. But there are reasons to hope. Despite months of sabre-rattling by international investors, the Mexican peso is surging ahead. At least in the short-term the threat of an investment strike has subsided – which should send a signal to radical candidates across the world concerned about capital flight. Donald Trump, meanwhile, is playing nice. For all the nonsense about AMLO riding a wave of anti-American anger, his approach has been patient and pragmatic. “We have to have enough patience to get to grips with President Donald Trump,” he said in June, “to maintain the relationship.” Of course, maintenance is a tricky thing: Mexico today is far too dependent on the United States, and past presidents have humiliated the country by deporting Central American migrants in a display of subservience. The relationship between the two countries must change. And AMLO is intent on changing it. But here again, we see his bind. Stand up for Mexico and the economy suffers. Swallow Mexico’s pride and sacrifice its principles. AMLO will never escape these painful trade-offs. But with Sunday’s election outcome, he has shown to the world that a strong, substantive, progressive platforms can still win mass popular support in Latin America – and earn political parties a mandate to navigate those trade-offs toward a better future. For AMLO and the entire Morena coalition, that work starts now. David Adler is a former Fulbright-García Robles Fellow.